Tell me more about the Fitness Festival! Here at Raintree Athletic Club, we pride ourselves on our Annual Fitness Festival. It is our showcase event of the year that gives us a chance to give back to the community by opening our doors to non-members and members alike for a morning focused on health, fitness and wellness. 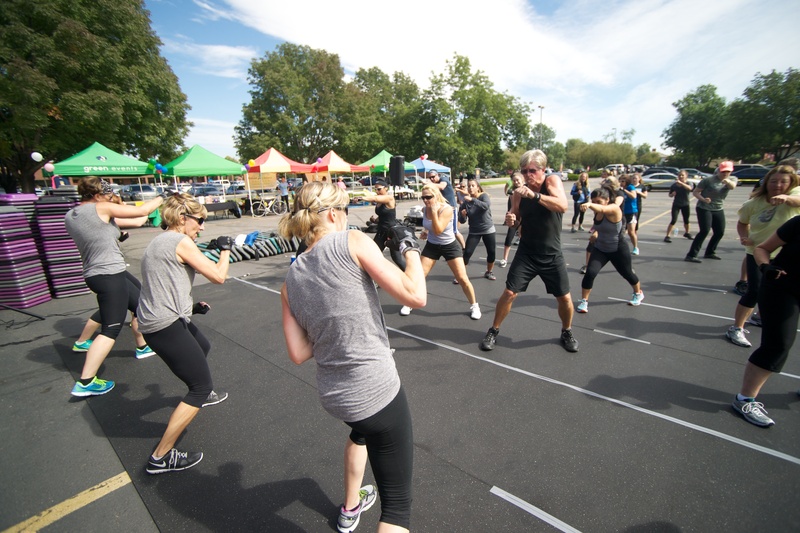 RAC trainers, group fitness and yoga instructors and numerous team members from every department at the RAC will be on hand on Saturday, August 8 for the 6th Annual Fitness Festival. This fun filled morning has grown each year as we continue to look for ways to grow and make this fundraising event better than the year before. There is something for everyone to get involved in, young & old, including 12 fitness classes both outdoor and indoor, visiting some of the local business booths in our business expo, jumping in our sports bounce house or getting your face painted, and this year a NEW strong man/woman competition. As with every year, this is a fundraising event to give back to the community through our RAC for Life Foundation. We hold a silent auction with goods and services donated from businesses in and around Fort Collins. We will also be accepting donations at our pancake breakfast from 8:00-10:30am, at our dunk tank (5 Shots for $4), and face painting booths. All money raised will be used to purchase new physical education and recess equipment for Lopez Elementary School. Silent auction donations have been provided by the Fort Collins Symphony, Sierra Trading Post, Coppermuse Distillery, Max Muscle NoCo and Pinot’s Pallet, Layton Family Dental, Green Roots Garden Design, Sienna Tan, The Summit in Windsor, Fort Collins Tours and many more. If you have never had a chance to try some of the classes offered at the club, this is a perfect opportunity. We are featuring the “best of” for our Les Mills programs including BodyPUMP, BodyCOMBAT, BodyATTACK, CXWORX, BodyFLOW, and BodyJAM. Zumba will also take place on our outside stage. Songs were nominated by our members to create 30 minute classes to introduce you to the programs. Most of these classes will take place outside in the RAC parking lot starting at 8 a.m. Heated power yoga, indoor cycling, Les Mills GRIT and Nia will all take place inside the club as another option for participants. Space is limited in BodyPUMP at 8:40am and Les Mills GRIT at 9:30am – please call the front desk at 490-1300 to reserve your spot for these classes. The event is open and FREE to the community, so bring a friend, share the event on social media, help us bring attention to this fun filled morning to get you moving and raise some funds to help keep kids active in our local schools.